Long and thin with plenty to do, from the salt flats in the north to the city of Santiago to the beautiful scenery in the south; there’s plenty to do in Chile! Sharing borders with Peru, Bolivia and Argentina there are a few different ways into the country. There are plenty of points of entry, however in winter (June to August) many can be closed due to snow fall, if this happens the cost of flights can rocket. Rather than listing all the points here there’s a great blog post on the various border crossings – http://greenash.net.au/thoughts/2011/04/highway-border-crossings-between-chile-and-argentina/ – Check before hand if they are still open. There’s a good air network in Chile with three main airlines, Aerolineas del Sur, Sky and LAN. Costs can be expensive, for example at the time of writing, from Arica to Santiago a single fair costs £280 booking a month in advance. However, book the same flight with a return flight it’s only £150! This happens with many flights, so make sure you check the cost of the return compared to a single ticket. That flight would take a couple of hours compared to 28 hours on the bus, so if you’re short for time it can be a great way to travel, however we tended to take shorter bus journeys and stay at smaller towns to break up the journey. The train in Chile runs from Santiago to Puerto Montt which is located in the south of the country. However the lines are not all connected which means you can’t get one train from Santiago to the bottom of the country. Costs are reasonable but there’s not many services. http://www.seat61.com/SouthAmerica.htm#Chile – The brilliant seat 61 has a small section on trains in Chile. Bus rule again in Chile. There’s a good range, including local, national, overnight sleepers, some can even be tracked on the internet. Cost and quality is between Argentina and Peru. Prices are decent with lots of competition between companies keeping prices competitive. Most cities and towns have out of town bus stations. You should be able to turn up and get on a bus. However during holidays and weekends things get booked up as expected so plan ahead if you are travelling during a national holiday. Prices range according to the type of seats. Similar to Peru and Argentina, the seats come as a normal seat, semi-cama and full cama. We didn’t cycle in Chile but there’s no reason not to. The change in scenery from north to south would be amazing however you would need to pack for multiple climates, hot in the north, cold in the south. Highway 5 runs from the border in the north to Puerto Montt in the south. So hitch hiking north to south should be easy. Check out http://hitchwiki.org/en/Chile for more information about getting around Chile with your thumb! It’s expensive unfortunately. There are some great privately run hostels but costs are relatively high compared to the rest of South America bar Brazil. At the time of writing a dorm in Santiago is around £9-12 with private rooms £13-20 in Santiago. Prices can change in the south with the summer season seeing the prices rise. Or the prices may stay the same and you get upgraded to private rooms. Most hotels include a breakfast, free hot drinks, free Wifi and computers. All tend to have kitchens to cook, seafood can be great to cook, many will have BBQs to use too, great for communal meals. Long term stays may get a discount, e.g. stay 5 days and get the 6th free. Watch out for public holidays and the holiday season’s in the south as places will get booked up. 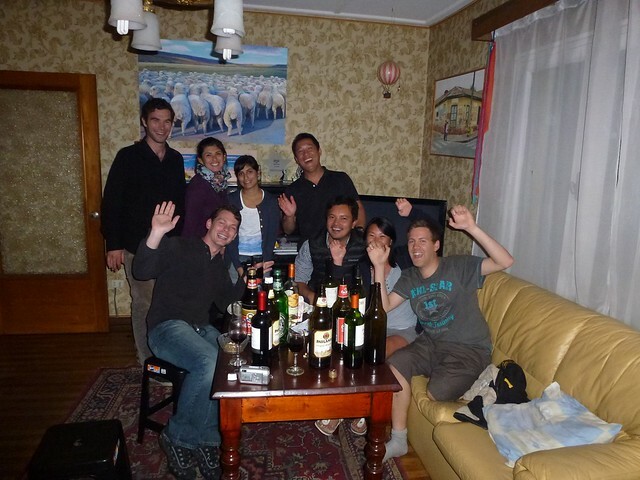 There’s a good range of hostels on Hostel Bookers and Hostel world. To the east steak rules in Argentina, but in Chile with the entire country flanked by the Pacific, seafood rules. However there’s still plenty of meat! Costs to eat out are not too bad in markets or cafes, however eating out for every meal could . 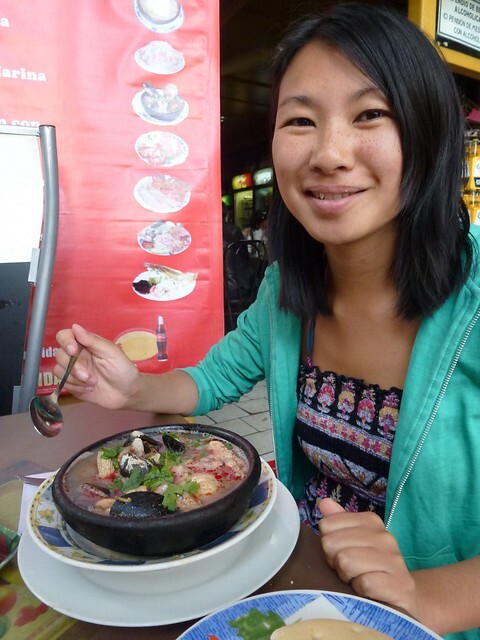 But with great local produce in the markets, supermarkets and decent kitchens in hostels it’s great to eat in. A couple of highlights include. Empanadas – All over South America you’ll find empanadas, for me Chile had some of the best and the biggest. In Vina Del Mar and Valparaiso there was a great variety of fillings too. Asado – A meat feast BBQ, great if there’s loads in a hostel up for the meat! From sausages to sirloin steak, similar to the Argentinean asado apart from the way they start the BBQ apparently. Fish – There’s great seafood to be had all along the coast, from shell fish to huge salmon there’s a great variety and plenty of it. In Santiago there’s a fish market where you can get a mix of dishes, the pick of the bunch is the paila marina, a mix of sea food in a soup. Chorillana – Great for a hangover or if you are very, very, very hungry. Chips, beef chunks, onions and eggs all in a massive pile. Don’t try to attempt on your own, bring a mate or a small army. Red wine – Oh yeah, the wine continues to flow in Chile and it’s only one colour. There’s wine tours to be done near Santiago, but just get to the local shop / supermarket to try. Bottles are around £3-4, for a really good bottle. Mote con Huesillo – Strange drink served in the summer from little carts on the street. Wheat seeds, peaches and syrup. Meant to be refreshing. Chilean Pisco – The Peruvians try to claim it as their own, however the Chileans also lay claim to the drink. Terremoto “Earthquake” – Didn’t get to try one but apparently a couple of huge Terremotos will leave you on the floor, ice-cream with wine, popular for the weekend of independence celebrations. Beer – Cristal and Escudo are the main large beers, generally sold in bigger bottles. In the south you can visit the Kunstmann brewery which is sold up and down the country. We only had time to visit some places in the south and central. So there’s plenty more to see. Pucon – Probably my favourite place in Chile. Chileans come here for a holiday. 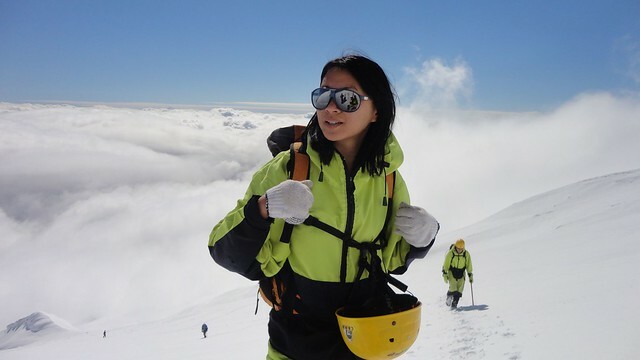 There’s some amazing scenery, hot pools, winter sports and volcanoes to climb. You could spend a week there and each day do something different. Santiago – The cool capital, lots of history, students and some nice places to drink. If you’re up for partying then the student area is great, head on a walking tour to find out about the history of the city. Viña Del Mar and Valparaiso – Only a short bus journey from Santiago the two seaside towns have plenty to see, do and eat. Viña Del Mar the modern garden city has the beach and tourist. 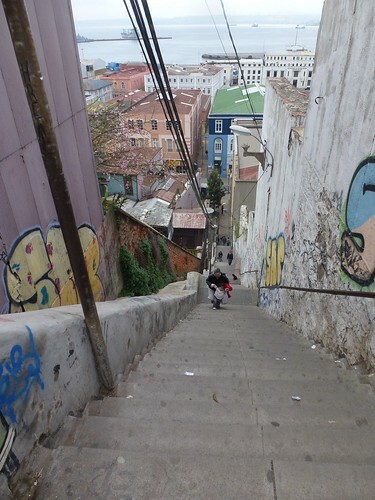 Whereas Valparaiso is the backpackers place with amazing graffiti, streets and seafood. Winter sports and walking – In the south there’s lots of small towns based around lakes, national parks, ski resorts. Plenty to see and keep active. Eat – Meat, fish and veg, plenty of it to be consumed. Salt flats – if you’re not going to Bolivia then you can visit the salt flats – Salar de Atacama in the north of Chile. Nearby, you can also go sandboarding.